Compared to its sister product (which uses leatherette trim), this nylon model is slightly less durable and provides an upgraded look. 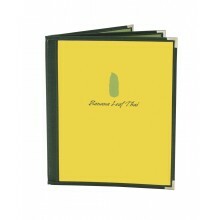 Protective metal corners extend the menu cover's useful life. The water resistant surface withstands spills and allows for fast cleaning. Production time: Usually ships within 5 - 7 business days. Call for rush production options. Custom orders and orders of 400+ units: Please call for pricing.